Make your presence known on the Internet with a professionally designed website. You need to be where your customers are looking for you. We know how to give you optimal exposure online. 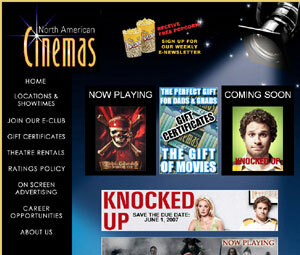 West World Media is the ONLY website hosting company dedicated solely to the movie exhibitor industry. Poster art, full synopses, streaming trailers and official site links for all current movie releases and coming attractions. Weekly updates with your schedule. Contests get your customers involved. 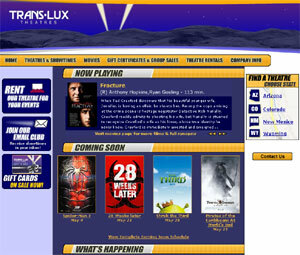 Online comment forms allow your customers to send you direct feedback about your website and theatre. Creative surveys are a great way to collect information. Selling gift certificates and tickets online.